One of the toughest choices parents need to make after having a child is when or if they should return to work. It’s common to feel guilty for even thinking about going back to work. However, long gone are the days where one parent could permanently stay at home and live off the other parent’s wage. If you’re a single parent, you definitely won’t have that luxury. Therefore, it’s often more of a necessity for parents to work these days. Or maybe you actually enjoy your career and it’s important for you to return? These days it is possible to be a parent and career person, yet there is still a lot of stigma surrounding working moms in particular. Whatever the situation, deciding when to go back can be difficult. If you’re struggling to make a decision, below you’ll discover everything you need to know, along with some useful advice on choosing the right time to go back to work. Planning Ahead – How Soon Should You Agree To Go Back? If you’re planning on having very little time away from work after giving birth, you may be wondering just how quickly you can return. You’ll likely have seen several high-profile women in the media who have given birth and returned within two weeks. It makes it look like giving birth is a fairly easy, straight-forward and routine task. However, what you need to know if you’re expecting your first child, is that even the most straight-forward of births can really take their toll on the body, both physically and emotionally. Two weeks afterwards, you’re highly unlikely to be in any fit state to return. Not only does your body need time to recover from the birth itself, but you’ll also need to recover from the initial shock of having a baby. Sleepless nights, getting into a good routine and dealing with the general changes that come once you have an infant are going to take a lot longer than two weeks to adjust to! So, if you’re just in the planning process right now, resist the temptation to agree to go back within two weeks. Trust me, you’ll be glad you did once your little one arrives! So just how quickly should you return? Well, it all depends on your individual circumstances. Generally speaking, the normal amount of time considered acceptable to wait is a minimum of six weeks. However, many women recommend taking at least four months off. There is no set time limit on when you should and shouldn’t return to work. It all comes down to your own preferences and requirements. Some women feel ready to return within six weeks, while others are still unable to return to a normal routine for months. 1. How Taxing Is Your Job And How Many Hours Will You Be Working? The less taxing your job is, the sooner you’ll be able to return. We’ve already established giving birth has a major impact on your body and it needs time to recover. If your job involves a lot of heavy lifting and physical work, you risk prolonging your recovery and potentially injuring yourself. Not to mention the fact that a physically demanding job is going to leave you exhausted by the time you get home. Similarly, the less hours you work, the easier it will be to transition back into the workplace. Starting out by working part time before you finally return to full-time work is highly recommended. You’ll find it much easier to juggle being a working mom if you’re only working 16-20 hours a week. 2. Is Your Employer Going To Allow Rest Breaks? 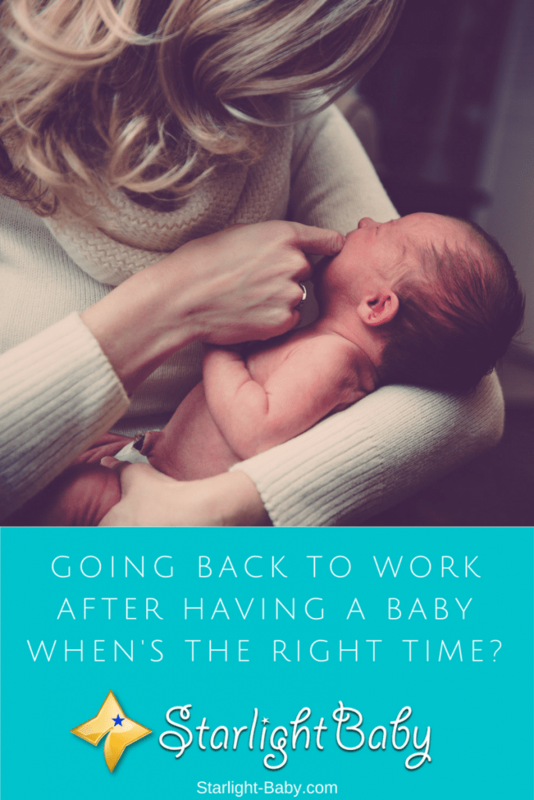 Many new moms find they need several breaks throughout the day when they first return to work; especially if their little ones are causing many sleepless nights! Without these breaks, you’ll soon find yourself getting over-exhausted. Just 2-3 minute breaks throughout the day can help massively so find out how your employer feels about this before deciding whether or not to go back. 3. Are You Breastfeeding Or Bottle Feeding? Whether you’re breastfeeding or bottle feeding, it won’t affect your ability t o go back to work, however with breastfeeding you will need to take several factors into consideration. For example, is there anywhere at work you’re going to be able to nurse or pump your breast milk? If your little one will be taken care of by someone else while you’re working, you’ll still need to pump your breast milk to avoid walking around with uncomfortable, engorged breasts! 4. Do You Have A Good Routine Set Up? You’re always going to worry about leaving your little one, it’s natural. However, without a proper routine you’ll end up worrying about all kinds of things. This in turn will affect the work you do and you’ll find yourself not performing well at work or at home! So, prior to returning to work, develop a solid routine that others can take over once you’re not there. Allow others to step in and feed your little one or put them down for naps. That way, your baby won’t be suddenly confused or distressed by the fact that you’re not there. 5. Is It Financially Doable? The main reason many moms return to work quickly is down to finances. They simply cannot afford to take extra time off, especially if they don’t have a good maternity package in place. However, unless you have a partner, friend or family member who can step in to help, you’re going to need to factor in the cost of child care. Can you afford daycare or to hire a babysitter? Add this to the cost of actually getting to work and the income you’ll be receiving to work out if it’s viable. It’s worth pointing out here that there are no right or wrong answers to the above questions. Nobody can tell you whether it’s the right time to return to work – only you know that. Sometimes the hardest thing is letting go of the guilt. Studies have actually shown that returning to work within a few months of giving birth has absolutely no impact on your infant. So, if you’re worried about causing your little bundle of joy trauma and separation anxiety, there really is no need. Overall, deciding when to go back to work is one of the toughest decisions you’ll make. Work out the advantages and disadvantages and then decide what’s right for you and your family. Try not to let anybody else’s opinion influence you – this is a decision only you can make and you need to feel comfortable with. My wife is a teacher. When the academic session ended, she was in the eight months. The new academic session would not start three months later. Therefore, my wife has had enough time to take rest during the ninth month and two months after the baby was born. When she joined her job, the baby was almost three months. We lived with our parents and when she went to work my mother took care of the baby. This arrangement helped us very much.